As hurricane evacuees stream out of Houston in what was supposed to be the first week of school, Dallas’s public schools are welcoming any students who want to enroll there. Dallas Independent School District leaders said they will register displaced students in city schools immediately — and even provide transportation to get them to class. “Students will not be turned away for any reason,” the district said in a statement on its website. “It’s too early to tell how many students we’re talking about, but we’re certainly ready to help out our brethren from the Gulf Coast,” district spokeswoman Robyn Harris told DallasNews.com. Students staying at the convention center will be placed at North Dallas High School, Alex W. Spence Middle School or John F. Kennedy Elementary School without having to provide the usual documentation, such as proof of residency, birth certificates, or immunization records. 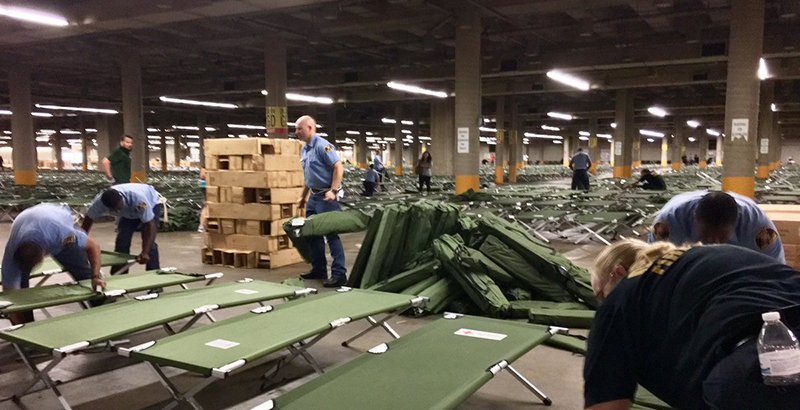 The district will provide transportation between schools and the Kay Bailey Hutchison Convention Center, which opened as a shelter for 5,000 people Tuesday. District trustee Miguel Solis told The 74 that hurricane relief is not new to Dallas, which also took in evacuees during Hurricane Katrina in 2005. “This is sort of in our DNA to want to step up and to want to support kids from all across the state,” he said. Two of the schools opening to displaced students are in his district. Solis started a drive for school supplies at his office Monday and said district staff will be on hand at shelters to help families enroll their children, as well as to provide information and counseling. The three schools are underenrolled, he said, so they have room for more children. If those schools fill up, the district will open others up to displaced students, Solis said. “The onus is on all of us to step up” when disasters like this happen, he said. Meanwhile, in Houston, continuing rain and flooding has prevented authorities from checking on all district schools, but at least 35 of 300 have water damage or power outages, according to The New York Times. Houston Independent School District Superintendent Richard Carranza said school will not open until after Labor Day, or later. “It’s a Houston-wide tragedy, so everybody is being impacted — our employees and our families,” Carranza told The Times. “We’ve been really transparent that weather conditions and, quite frankly, city infrastructure are going to determine whether we are going to safely be able to open” on Sept. 5.